As we know, the ancient Chinese people selected five great mountains in the country, that is, Mount Taishan, Mount Hengshan(south), Mount Huashan, Mount Songshan and Mount Hengshan(north). But whoever chose the mountains must have never seen Mt. Huangshan(Yellow Mountains), because as a Chinese saying goes, "After returning from Mount Huangshan, there is no need to see other mountains." Located in the south of Anhui Province. Mt. Huangshan(Yellow Mountain) has 72 peaks, 24 streams, three waterfalls and two lakes Lotus Peak, Mount Huangshan's highest, is 1,864m above sea level. 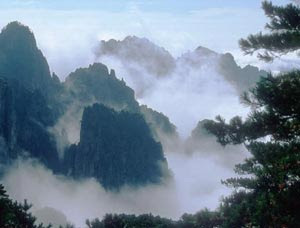 The four wonders of Mount Huangshan are strangely shaped pines, grotesque rocks, cloud seas, and hot springs. The beauty of Mt. Huangshan(Yellow Mountain) is so enchanting and unique that countless painters and poets have visited Mt. Huangshan(Yellow Mountain) to find inspiration. The Huangshan School of painting originated in the later years of the Ming Dynasty from the inspiration of Mount Huangshan's precipitous peaks. The poems and paintings about Mount Huangshan left by these artists and men of letters add cultural charm to the great mountain. The pines with their fascinating shapes, the rocks with their strange contours, the sea of mist and clouds, and the hot springs -- these are the four wonders of Huangshan. Many of the pines on the mountain have their roots deep in rock crevices; the famous Welcoming Guests (Yingke) Pine is representative of these hardy trees. The temperature of the mountain's hot spring-water is around 42°C throughout the year. Clear and sweet, the water is ideal for drinking and bathing. Tourists should not miss a visit to North Sea, (Beihai), West Sea (Xihai), Celestial Capital (Tiandu) Peak, Jade Screen (Yuping) Tower, and Cloud Valley (Yungu) Temple, which are among the prettiest sights on Mount Huangshan. Cool (Qingliang) Terrace is the best place for watching the sunrise and the clouds. Huangshan's charm has drawn many distinguished travelers, including poets, writers, and painters of various dynasties, and tourists continue to flock to this legendary mountain all the year round. The most famous scenic spots of Mt. 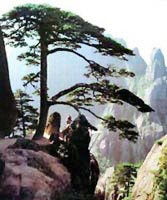 Huangshan(Yellow Mountain) include Lotus Peak, the Pock That Flew from Afar, and the Welcoming Guests Pine. At present, Mt. Huangshan(Yellow Mountain) is a national park and is on UNESCO's World Heritage List.